A fat, yellowish moon is shining over the dungeon entrance. From a crack in the decrepit rock, the freezing scream of the Banshees rises, a deadly chant for anyone who hears it. Many adventurers are sent to challenge the dangers craving in the underground dominion of the Lich, very few are those who come back. Werewolves, Vampires, Zombies and Skeletons hordes are waiting in the dark, silent rooms. Anyway, the Archmage has commanded, and you must obey: the Undead will be a precious adding to the MiniMonFa menagerie! 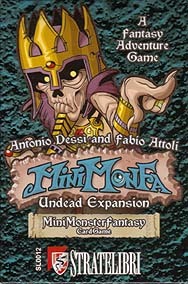 The MiniMonFa Card Game's Undead Expansion contains a crowd of terrible monsters which you can use to fill your dungeons, six brand new heroes - such as the dreadful Necromancer, the ferocious Werewolf, the might Knight and the treacherous Assassin - and new magic items, unique Undead abilities, new Trap cards!